Welcome to the spring semester. It’s been a while since my last “Words from Wallis Hall,” but I wanted to take a moment to discuss a number of remarkable things going on at the University. Of course, I share everyone’s excitement at the announcement last month of Sarah Mangelsdorf as our next president, and I look forward to working with her in the coming months to ensure her smooth transition to Rochester this summer. 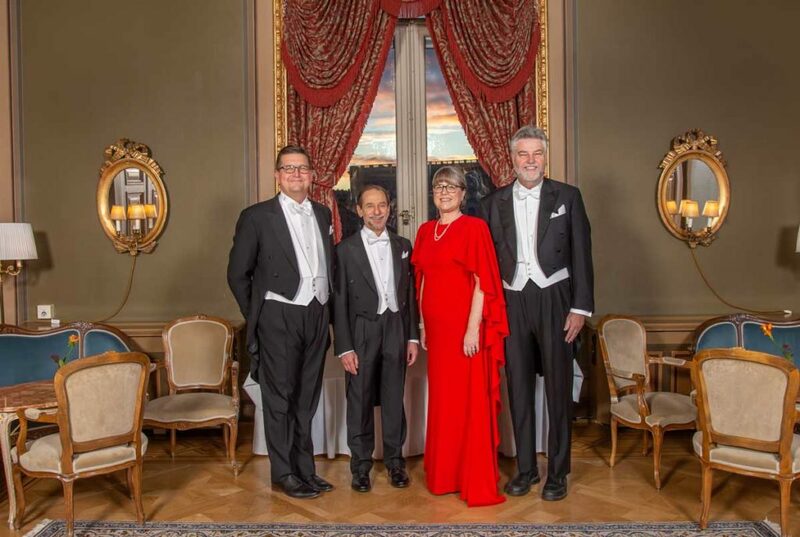 Another memorable December moment for me was attending the Nobel Prize ceremony in Stockholm, Sweden, at the invitation of our alumna, Donna Strickland ’89 (PhD), who made history as only the third woman to receive the Nobel Prize in Physics. She was also the first woman laureate in Rochester’s history. In addition to inviting me, Donna invited Scott Carney, the director of the Rochester’s Institute of Optics, and Michael Campbell, the director of the Laboratory of Laser Energetics to participate. Professor of Optics Wayne Knox joined us at the event as a guest of Strickland’s co-recipient, Gérard Mourou. It’s very clear that Donna holds Rochester in high regard and claims our University as the place where she received her education, met her colleague Mourou, and undertook the research for which she received her Nobel recognition. I believe that Strickland and Mourou’s work reflects Rochester’s mission as a top-tier research university. Their study of chirped-pulse amplification pushed lasers to higher intensities and helped innovate everything from cancer treatments and eye surgery to smart phone technology and how we understand energy at an atomic level. Receiving a Nobel Prize is one of the world’s greatest honors and very few of us will ever reach that level of recognition for our work. However, I believe the spirit of Meliora is driven less by a desire for recognition and more by a relentless ambition to leave our world, and the University community, better than we found it. We can all take pride in being part of an institution that claims among its faculty and alumni distinguished scholars such as Strickland and Mourou. They join an impressive list of laureates who have a substantial connection to Rochester, including fellow 2018 recipient Paul Romer, who was awarded the Nobel Prize in Economics for his development of endogenous growth theory. Other Rochester recipients of the Nobel Prize include such notable scholars as Richard Thaler ’74 (PhD) in recognition of his work in behavioral economics, former Secretary of Energy Steven Chu for developing methods to cool and trap atoms, and Arthur Kornberg ’41 (MD), who first discovered a way to synthesize DNA. Congratulations Donna Strickland and Gérard Mourou for receiving the Nobel Prize in Physics, and welcome Sarah Mangelsdorf, to the Rochester community. And welcome back to everyone returning to campus after the winter break. I wish you a successful and productive semester. Words from Wallis Hall is a regular communication from President Feldman that serves as an ongoing opportunity to share important updates on the University’s efforts to strengthen a culture of respect, and to keep the campus community informed of people and programs that make Rochester a world-class institution.